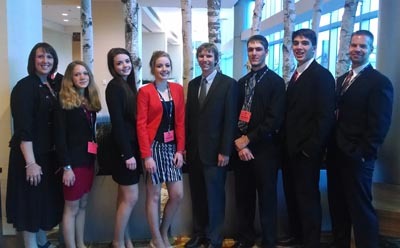 Six Wood River High School students, members of the Business Professionals of America, fared well earlier this month at the BPA National Leadership Conference in Indianapolis, Ind., with one of the six bringing home a trophy for a second-place finish. Caitie Sfingi, a sophomore, competed against 63 other students from throughout the nation and ended up with second place in the “fundamental desktop publishing” competition. Sfingi also placed fifth out of 48 competitors in the “graphic design promotion” category. Students Lucas Robertson, a junior, and Chandler Gifford, a senior, placed fourth and eighth, respectively, in the “C++ programing” competition out of 45 competitors. “This year’s group was exceptional. The National Leadership Conference was held April 28 through May 4. WRHS business education/technology teacher Lisa Hoskins, who serves as advisor to the high school BPA group, said that even qualifying for national competition is an accomplishment. Participants had to first qualify at a regional competition and then at a state competition. Hoskins said that six is the highest number of WRHS students that have ever qualified for national competition, and that the second place won by Caitie Sfingi is the highest ranking ever achieved by a WRHS student in national competition. Hoskins also noted that Coplin is the first WRHS freshman who has ever qualified for nationals. Hoskins noted that only one of the six students is a senior and that it will be “great” have the rest of them competing in BPA events in future years.